without any organic solvents such as phenol / chloroform. Purified total RNA is known to perform reliably and extremely well in experiments sensitive to DNA contamination, such as qPCR / RealTime PCR analyses or microarray hybridizations. For virtually all applications, DNase digestion is not required, thus saving lab time, material and eleminating any unwanted RNA loss due to residual RNase activity, which remains present in many "RNase free" DNase preparations. In most applications, purified RNA is of considerably higher quality as compared to RNA obtained from "classic" phenol / chloroform based extraction methods. The RNA purification procedure is extremely gentle: RNA is neither degraded by residual RNase activity present in DNase preparations, nor affected by the attack of free radicals present in phenol formulations. Figure 1: Quick quality control of purified RNA (GeneMatrix Universal RNA Kit), isolated from human dermal fibroblasts, on an 1% [w/v] agarose gel. Lane MW: PerfectPlus 1 kb Ladder [5 µl]. Lane 1: Purified, non-DNase treated RNA from human dermal fibroblasts. 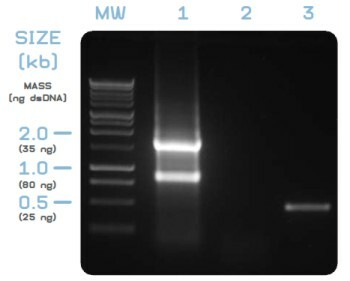 3 μl purified RNA from a total elution volume of 50 μl were directly applied on the gel. 28S / 18S rRNA ratio is visibly >2, indicating high quality of purified RNA. No band at ~20 kb is observed, indicating purified RNA is free from genomic DNA contamination. Lane 2: PCR from purified, non-DNase digested RNA did not yield any PCR product, confirming the absence of contaminating DNA from purified RNA. Lane 3: PCR from cDNA (derived from the RNA sample shown in lane 2), specific for the human β-actin "housekeeping" gene as described below, gave an amplicon of the expected size (470 bp). No band with a size of 565 bp is present, indicating cDNA was entirely derived from RNA and did not contain contaminating traces of genomic DNA. PCR and RT-PCR conditions: RNA was extracted from human dermal fibroblasts following the kit supplied protocol for cell culture RNA isolation. DNase digestion was not performed. 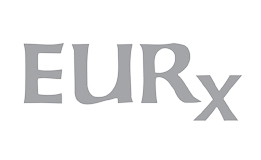 Oligo dT primed cDNA was synthesized from purified RNA using EURx AMV Reverse Transcriptase Native, as described in the product manual. Human β-actin gene specific PCR from purified RNA and from cDNA was conducted using OptiTaq DNA Polymerase with the PCR conditions outlined below. 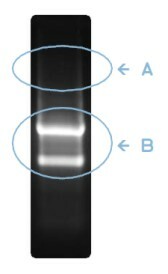 3 µl each of purified RNA and of both PCR reactions, respectively, were analyzed on an 1% [w/v] agarose gel. Note: Due to general differences in form factors, secondary structure formation and resulting migration behaviour between single- and double-stranded nucleic acids, 28S rRNA (~5030 nt) and 18S rRNA (~1900 nt) migrate faster through the non-denaturing agarose gel matrix as compared to dsDNA MW marker bands. Purity of RNA from DNA contamination is experimentally confirmed by PCR. For purified RNA, quality control PCR is conducted as follows: (1) 1 µl of purified RNA and (2) 1 µl of genomic DNA or cDNA (serving as positive control), respectively, are used as templates for setting up two PCR reactions. Quality control PCR conditions for RNA from human sources: Gene-specific primers for the "housekeeping" human beta-actin gene ß-Ac-fwd (5‘-CGG ATG TCC ACG TCA CAC TT-3‘), ß-Ac-rev (5‘-GTT GCT ATC CAG GCT GTG CT-3‘). PCR amplification parameters 95°C/120 s / 30x [94°C/30s – 60°C/30s – 72°C/60 s] / 72°C/600 s, as described elsewhere (Adjaye et al. (1999) Gene 237: 373–383). RNA quality control PCRs from non-human sources require other, organism-specific primers and PCR conditions. PCR starting from purified total RNA as template must not yield any product. PCR must remain negative to ensure that RNA is DNA-free. PCR starting from human genomic template DNA yields a ~ 565 bp amplicon. PCR starting from human cDNA templates yields a ~ 470 bp amplicon. Note: This human RNA QC PCR assay allows to differentiate between amplification from genomic DNA templates (~ 565 bp amplicon) and cDNA templates (~ 470 bp amplicon), thus enabeling post-RT detection of genomic DNA contaminations in cDNA samples (even if genomic DNA contamination was already present before cDNA synthesis). The underlying concept: Short PCR amplicons (ideally 200 - 600 bp) are chosen for efficient amplification and sensitive detection of contaminating DNA. For human RNA QC PCR, a ~ 95 bp non-coding sequence stretch, short enough not to affect PCR efficiency of the larger genomic DNA fragment, allows to differentiate between genomic and cDNA templates. QC PCRs from non-human sources may benefit from analogous thoughts for primer design. (A) High quality RNA does not contain DNA contaminations (observable as ~20 kb band in DNA-contaminated RNA preparations; to be independently verified by direct PCR from purified RNA, which must remain negative). (B) In high quality RNA preparations, ribosomal RNAs, in particular the 28S rRNA (~5030 nt) and 18S rRNA (~1900 nt) are present at a 1:1 stochiometric ratio and form two prominently visible bands (migrating considerably faster as compared to dsDNA markers). As theoretically inferred from molecule sizes, the 28S rRNA band should appear 2.7 times as bright as the 18S rRNA band. Considering sample specific variations, an 28S to 18S ratio of >2 is indicative for high quality RNA. 28S/18S ratios <2 indicate RNA degradation and are commonly observed in poor quality RNA preparations. For fully completing quality control, check RNA purity by spectrophotometric measurement in parallel. (such as T7 mediated RNA transcription). optional on-column DNase digestion step (not required for almost all applications).